Плюсы от смены платформы на Windows Server 2008, улучшенный стек TCP/IP протокола, SMB2, Failover Clustering, Server Manager. Новая версия Single Instance Store (SIS) — системы де-дубликации файлов, которая теперь поддерживает до 128 томов на сервер (раньше было 6) и улучшенная поддержка Failover Clustering. Новая версия iSCSI target 3.2 , включая поддержку Ipv6, обновления VSS/VDS и опять же улучшенную поддержку Failover Cluster. В комплект поставки включен инструмент Storage Manager for SANs (SMfS), предназначенный для решения стандартных администраторских задач. Функциональность компонента File Server Resource Manager (FSRM) также была расширена за счет реализованной поддержки квот, механизмов сокрытия файлов и более совершенных средств генерирования отчетов. Служба Virtual Disk Service (VDS) предлагает дополнительные возможности управления логическими идентификаторам LUN, в том числе позволяет и отключать устройства, изменять размер дисковых массивов, а также присваивать и отменять статус readonly. Вот несколько сценариев в которых вы можете опробовать ознакомительную версию Windows Storage Server 2008.
например в качестве тестовой среды для Hyper-V (используя Windows Server 2008 или Windows Server 2008 R2) используя iSCSI Shared Storage. среда разработки — SQL Server cluster (2 узла + shared storage). Windows Server 2008 R2 Cluster Shared Volumes (CSV) и Hyper-V Live Migration используя только обычное Windows Server оборудование. проверить, как работает WSS 2008 Single Instance Storage (SIS). В процессе установки Windows Storage Server 2008 вам нужно будет выбрать версию продукта: Basic, Workgroup, Standard или Enterprise. Если вы подписчик TechNet Plus или MSDN у вас есть доступ ко всем продуктам и максимальную функциональность вы получите в версии Enterprise. Однако ваше оборудование должно поддерживать x64 технологию, версия Enterprise только для x64 систем. Если ваше оборудование не поддерживает x64 технологию, выбирайте Basic он распространяется как x86 и как x64. Но Basic не поддерживает iSCSI target 3.2. Выбор версий будет возможен только если вы ставите на x64 систему и не вводили ключ продукта. Если вы ввели ключ продукта, то система сама определит нужную версию, если вы ставите на x86 систему, то возможно будет выбрать только Basic Edition. Подписчики могут скачать все с MSDN или TechNet Plus и там же получить ключи. Q: I tried to install the Microsoft iSCSI Software Target 3.2 on Windows Server 2008 (or Windows Server 2008 R2) and I got an error saying “Installation is not supported on this operating system”. What’s the problem? A: The Microsoft iSCSI Software Target 3.2 can only be installed on Windows Storage Server 2008 Standard, Enterprise or Workgroup. 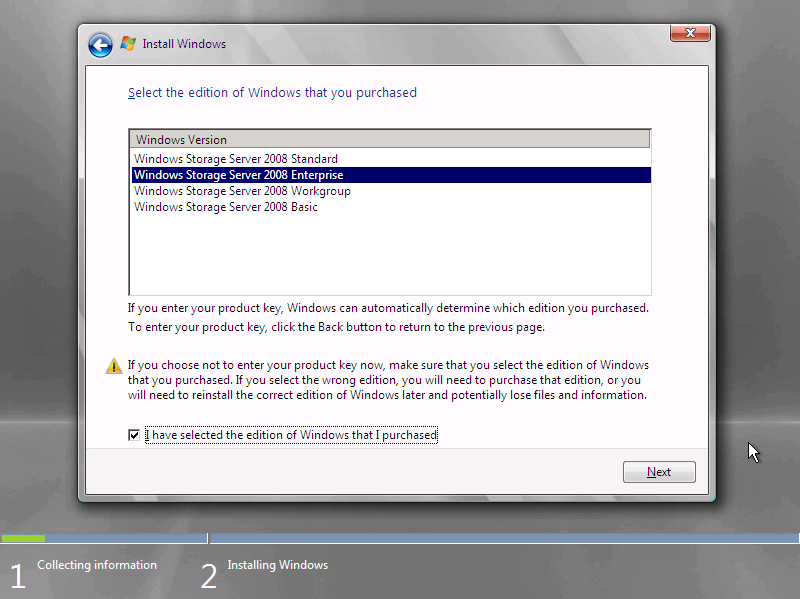 It cannot be installed on other OS version, like Windows Server 2008 or Windows Server 2008 R2. Q: I completed the Windows Storage Server 2008 setup but I don’t know what username and password should be used to logon after the installation is completed. Where can I find that information? A: Review the Windows Storage Server 2008 Release Notes (WSS2008_RELNOTES.DOC), which can be found in the “Tools” ISO file, the last one on the file list above. 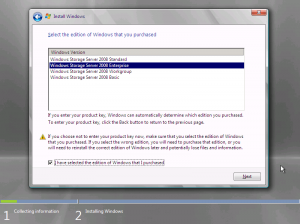 Q: Should I apply Windows Server 2008 Service Pack 2 (SP2) to Windows Storage Server 2008 as it becomes available? A: Yes. We also recommend enabling Automatic Updates for Windows Storage Server 2008 if you downloaded it from MSDN or TechNet Plus. If you have an OEM copy of Windows Storage Server 2008, you should contact your OEM for guidance in this area. Q: I can’t find the x86 version of Windows Storage Server 2008 Standard, Enterprise or Workgroup. Where is it? A: Windows Storage Server 2008 Standard, Enterprise and Workgroup are provided for x64 only. Q: I can’t find the documentation for Windows Storage Server 2008. Where is it? A: The documentation is in the “Tools” ISO file, the last one on the file list above. That includes the Windows Storage Server 2008 Release Notes (WSS2008_RELNOTES.DOC), the Windows Storage Server 2008 Getting Started Guide (WSS2008_GSTART.DOC), the Windows Storage Server 2008 OEM Guide (WSS2008_OEMGUIDE.DOC) and the Windows Storage Server 2008 Extensibility and Branding Developer Documentation (OEM-EXTENSIBILITY\WSS2008_EXTENSIBILITY.DOC). Q: Can I install my MSDN or TechNet Plus version of Windows Storage Server 2008 with the Microsoft iSCSI Software Target 3.2 in a Hyper-V virtual machine? A: Yes, if you downloaded it from MSDN or TechNet Plus. Make sure to install the Hyper-V Integration Components when you do so. Q: I am not an MSDN or TechNet Plus subscriber. How can I download an evaluation version of Windows Storage Server 2008 with the Microsoft iSCSI Software Target 3.2? A: Evaluation versions of Windows Storage Server 2008 with the Microsoft iSCSI Software Target 3.2 are only being offered to MSDN or TechNet Plus subscribers. Q: How can I subscribe to MSDN or TechNet Plus? A: You can learn how to subscribe using http://msdn.microsoft.com/subscriptions for MSDN andhttp://www.microsoft.com/technet/subscription for TechNet Plus. Q: Can I use the MSDN or TechNet Plus version of Windows Storage Server 2008 with the Microsoft iSCSI Software Target 3.2 in my production environment? A: No. As with any software you download from MSDN and TechNet Plus, they can only be used for evaluation (TechNet Plus or MSDN), demonstration (MSDN), development (MSDN) or test (MSDN). Review the details at http://msdn.microsoft.com/en-us/subscriptions/cc150618.aspx for MSDN and athttp://technet.microsoft.com/en-us/subscriptions/cc294422.aspx for TechNet Plus. Q: I am an MSDN or TechNet Plus subscriber. Can I share this MSDN or TechNet Plus software with other people in my company that are not MSDN or TechNet Plus subscribers? A: No. Each person that needs to install or access the software needs his or her own subscription. Review the details at http://msdn.microsoft.com/en-us/subscriptions/cc150618.aspx for MSDN and athttp://technet.microsoft.com/en-us/subscriptions/cc294422.aspx for TechNet Plus. Q: How can I obtain a copy of Windows Storage Server 2008 with the Microsoft iSCSI Software Target 3.2 for my production environment? A: You need to acquire an OEM solution that comes pre-installed with Windows Storage Server 2008 with the Microsoft iSCSI Software Target 3.2. To find a list of OEM partners, see the links section below. Q: Can I license just the Windows Storage Server 2008 software (or the Microsoft iSCSI Software Target 3.2 software) for production use without an OEM hardware? A: No. This software is only licensed for production use as part of an OEM solution.